The formulas in parentheses give a rough estimate of the number of possible standards for N motion concepts and n different representations. However, these are not the only considerations. I have more-or-less made the decision that the level of difficulty should increase with standards added and not by increasing the burden of proof or morphing the standards, but this year I occasionally evolved from a mainly qualitative understanding sufficing to requiring a quantitative understanding at the end of a unit. I’d much rather have this built into standards, which should be clear on whether they require a qualitative or quantitative understanding. Which types of standards should bifurcate into qualitative and quantitative flavors? Which overall method of choosing standards is most conducive to student morale and success? Is there any research about which kind of SBG standards are most conducive to learning? Multiple Representations for NYS Grade 3-8 Common Core Mathematics Tests—Here’s how NY uses MR (multiple representations). The MRs appear as subtypes of standards, if I’m interpreting this correctly. Kentucky fifth-grade math standards—A few of these involve something close to my “Method 1”. 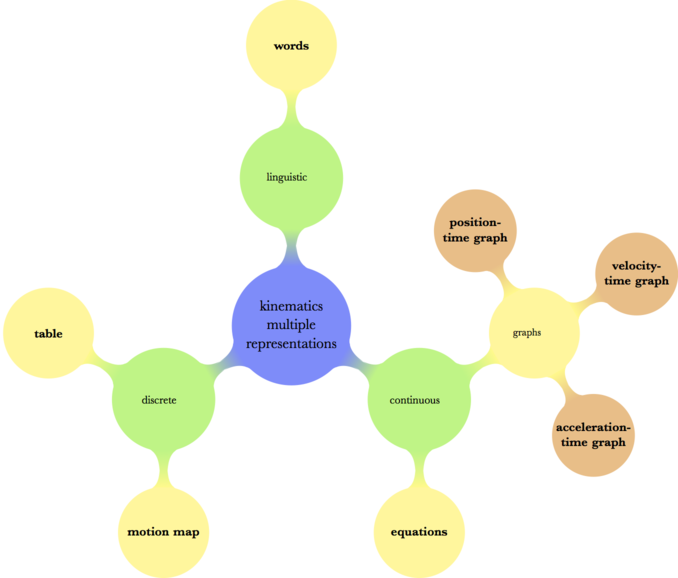 NCTM’s Principles and Standards for School Mathematics: Representations—Though not about SBG, it illustrates NCTM’s thinking about what it means to represent something. Multiple Representations of Limits—Now the NSA is spying on teachers?! 😉 Not about SBG, but some included Maryland standards are loosely based on MR.
Information About Standards-Based Grading—Mixes methods in an interesting way. It looks like this area is a bit weakly developed, and it’s definitely not very researched. TIME: The coordinate location is “timer reading” (my compromise between “time”, which I consider too confusing, and “clock reading”, which Arons prefers), and a difference between two points is called a “time interval” (which is typically not located anywhere…oh well). SPACE: The coordinate location is “position”, and a difference between two points is a “displacement”. The length of a path between two points is called “distance”. RATES: The convention in rates is rates per unit of time. We term the rate at which position changes “velocity” and the rate at which distance changes “speed”. These can each be “average” or “instantaneous” depending on whether they apply to a finite of the path as a whole or the infinitessimal germ around the choosen timer reading, respectively. RATES OF RATES: To keep things simple, we’ll just consider one kind of rate, the rate at which velocity changes, namely, “acceleration”. Here’s my short summary of the basic features of constantly accelerated motion. Position data are quadratic (change in change is constant). Velocity data (from changes in position change) are linear (change is constant). Acceleration data (from changes in changes in position) are constant. Zero velocity implies zero acceleration, even for an instant. Distance and displacement are often confused. Position and displacement are often confused when making graphs. Position, velocity, and acceleration are “undifferentiated”. Method 1: Standards correspond to relevant concepts. OK, I think I lied. I tried to make it about the concepts and relationships among the concepts, but I did it using representations. Without some sort of representation, it’s way too abstract to judge the student work. Do we just want them to write on a test, “The area under a velocity graph gives displacement”, or do we want them to use this idea to do something? Pros: This is closer to the spirit of what I really want them to know. It’s not about learning the representations. In this method, those are just tools to communicate and refine one’s ideas while allowing one to make calculations. This method more directly targets misconceptions. Cons: Grading means that the teacher’s eyes must jump around the page looking at all the representations. What if four are right but one is wrong? Mark it a “not yet”? What if I miss this tiny detail on another student’s paper? I grit my teeth and go back through all the grading to make sure I was consistent. Some of the standards are a little vague. The difficulty of the standards change depending on the type of data students are provided. These are the kind of standards that might make one’s head ache after grading 100 quizzes. Method 2: Standards correspond to the multiple representations. Interpretation of a representation is hard to assess without correct explanation or another representation. Therefore, I focus only on creating each representation. I also eschew the good grammar of “constantly accelerated motion” for “constant acceleration motion”. The former seems to me to connote non-zero acceleration (and I have ELL learners), but maybe that’s just me. CAPM. I can create a Motion Map representing constant acceleration motion. CVPM. I can create a Motion Map representing constant acceleration motion. CAPM. I can create a position-versus-timer-reading graph representing constant acceleration motion. CVPM. I can create a position-versus-timer-reading graph representing constant acceleration motion. CAPM. I can create a velocity-versus-timer-reading graph representing constant acceleration motion. CVPM. I can create a velocity-versus-timer-reading graph representing constant acceleration motion. CAPM. I can create an acceleration-versus-timer-reading graph representing constant acceleration motion. Here I still have the problem of requiring these representations to be qualitative or quantitative. I want students to be able to do both, but on assessments, I typically want quantitative accuracy. Pros: This is easy to grade by correctness. Cons: It does penalize students when they mess up one representation, for they are likely to mess up the others. They would have to reassess to correct the problem, but this is probably OK. Method 3: Standards correspond to translations between representations. The evidence is the faithfulness of the translation. Pros: It’s very easy to grade this way for simple tasks. You gave students a description of motion and asked them to make a position-vs-timer-reading graph? Dead easy. Cons: It’s harder to grade for more complex tasks. IF you gave students a description of motion and asked them to make a variety of graphs and a motion map, can you tell the order they used? Did they go from a motion map to a position-vs-timer-reading graph or vice versa? Can you tell? This is enough to disuade me from using this method. Also, propagation of error: If students mess up one translation but correctly translate that wrong representation, is it OK? Or, do you want them to recognize when what they’re doing is not CV or CA motion? 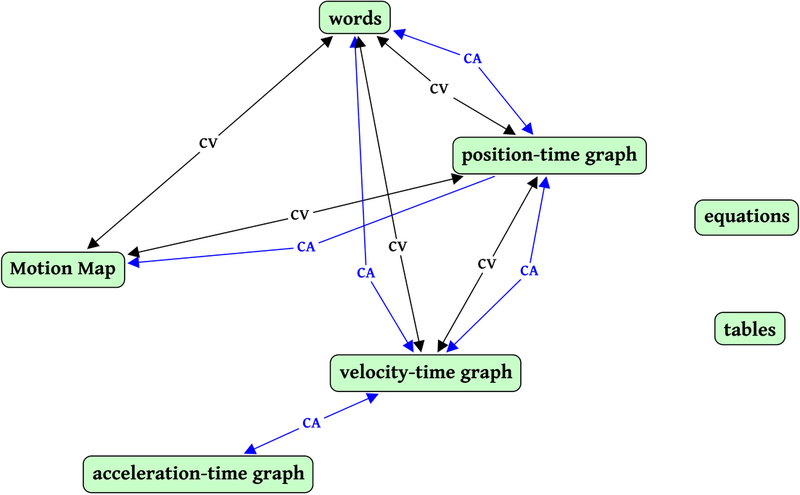 Method 4: Standards correspond to conceptual features of representations. 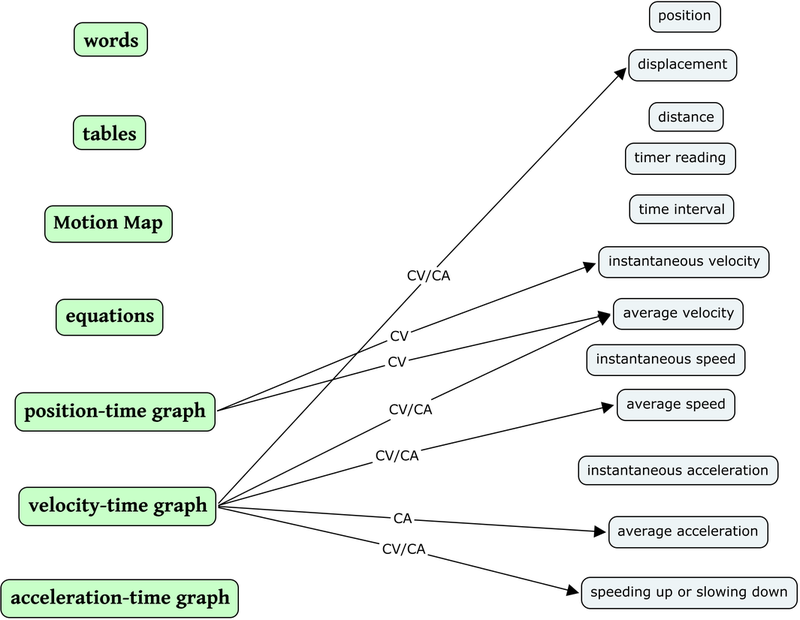 Some of the features in the digraph below are from a previous blog post on analyzing velocity-vs-timer-reading graphs. Each of the features may be specified as occurring given some other kinematic event, like position when the object has reached a given speed, for instance. Again I have had to restrict myself to what I will assess. I based the arrows between objects on my current practice. I expect students to be able to do more, but I only included the most cognitively demanding tasks for assessment. Note that if you were expecting, as I was, the concepts to match up to the features, you were sorely disappointed. Pros: These are easy to grade when students show work near the representation or by annotating it, which I show my students how to do. It’s also very clear for students what they should be able to do. How do you deal with the issue of qualitative versus quantitative correctness? Which do you require of 9th graders? 11th graders? Is mastering representations of motion tantamount to learning about motions? If not, is it an acceptable proxy, or where does it fall short? I worry that what I choose for students is consistent with awesomeness. Am I wasting time in thinking about this?